Access to safe, affordable running water is a basic necessity and fundamental human right. However, our nation’s crumbling infrastructure, coupled with ill-considered policy decisions, is increasingly putting clean water out of reach for many Americans. And while Flint, Michigan, made headlines for its poisoned water, contamination is not the only water-related concern facing an increasing number of communities across the United States. 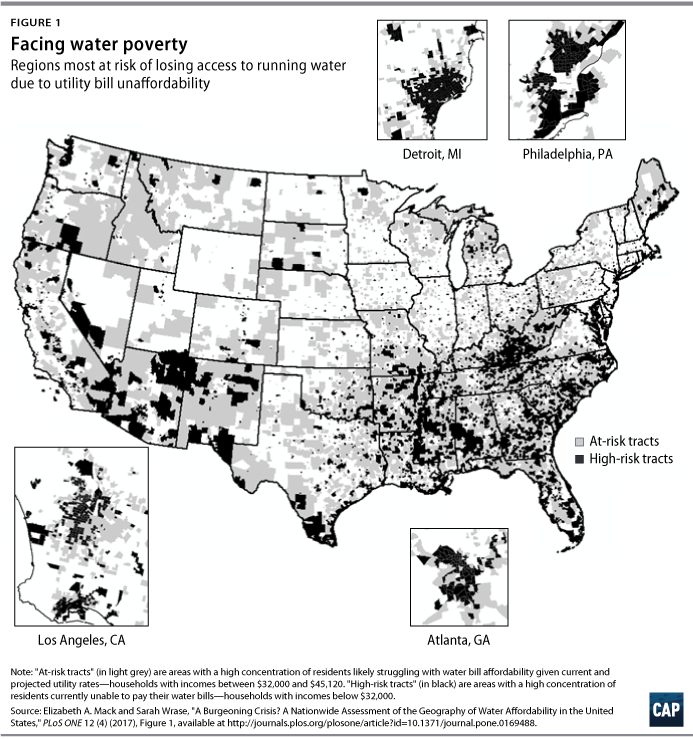 Cities from Detroit to Baltimore and Chicago to Los Angeles—as well as rural and suburban communities in Arizona, North Carolina, Kentucky, and Mississippi—are also contending with soaring water utility rates and, consequently, a rapidly rising affordability crisis among their most vulnerable residents. The ripple effects of these cost hikes could be catastrophic and lead to a variety of detrimental and disproportionate outcomes, including situations where largely poverty-stricken and elderly residents of color lose their homes due to unpaid water bills. 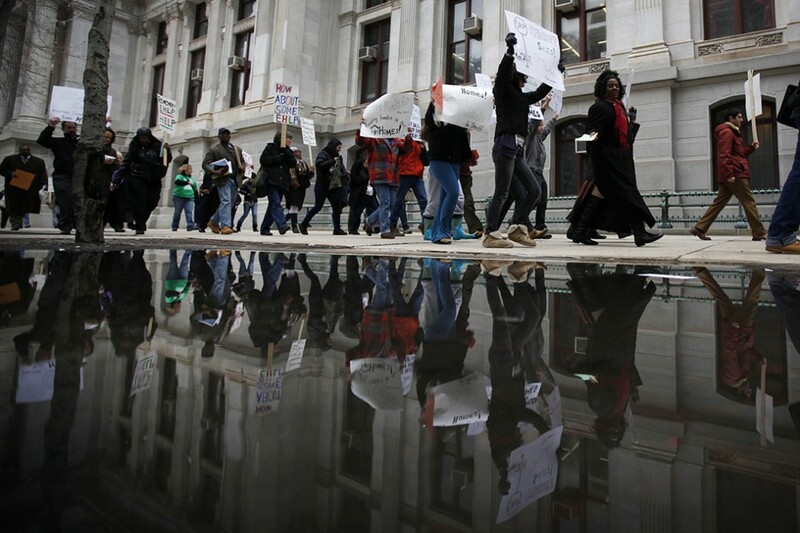 Philadelphia has become a bright light in combating the issue of unaffordability, creating a first-in-the-nation assistance program that bases the water bills of financially strapped residents on their ability to pay. This groundbreaking program has made Philadelphia a model for communities that must begin to focus earnestly on preventing vulnerable residents from falling into a debt spiral because they cannot afford access to safe and affordable running water. With an average monthly household water, sewer, and stormwater bill of around $70.87, the number of Philadelphians unable to pay is staggering at nearly 40 percent. In fact, roughly 1 in 5 Philly residents—disproportionately black and Latino households—have had their water disconnected at least once since 2012 as a result of falling behind on their water payments. According to the Philadelphia Water Department, missing two consecutive payments of a past-due amount totaling just $75—about the cost of one monthly bill—can trigger a household’s water to be shut off. Unfortunately, Philadelphia is not an outlier. The affordability of water services is a growing concern for communities across the nation. A recent study on water affordability found that roughly 13.8 million U.S. households could not afford to pay their water bill in 2014. The study found that while access to water has remained relatively affordable until recently, water rates have increased around 41 percent in just the past seven years. Should the rate hikes continue at this pace, according to the report, more than one-third of all U.S. households—35.6 percent—will be unable to afford running water by 2022. One of the main factors contributing to the rising cost of water is the same culprit responsible for increasing exposure to irreparable lead poisoning: rapidly aging and strained 70-year-old to more than 100-year-old drinking water, wastewater, and stormwater infrastructure with long overdue repair and replacement needs to the tune of at least $655 billion over the next 20 years. As if the massive infrastructure challenges facing localities were not enough, the proportion of direct federal financial support for the nation’s water systems has fallen by half since 1977, leaving, over time, the majority of public works funding responsibility on budget-constrained state and local governments. Cities and states are also increasingly shouldering the bulk of costly maintenance and repair responsibilities established under the 1972 Clean Water Act and the 1974 Safe Drinking Water Act, the premier laws protecting the health, quality, and accessibility of the country’s water. If the upsurge in water rates continues without equitable mitigation, financially struggling communities across the country will be unable to cope. Southern states such as Mississippi, Alabama, and Louisiana are likely to be the hardest hit, given in part to their higher shares of concentrated poverty, people of color, residents with disabilities, socio-economic immobility and inequality. These states are followed by Midwestern and Western communities in West Virginia, Ohio, Michigan, New Mexico, and Arizona. Local communities’ efforts to deliver clean, affordable water to their struggling residents are further hindered by President Donald Trump’s regressive actions that place the health and safety of the nation’s already vulnerable water infrastructure at greater risk. To name a few, the Trump administration is seeking to dismantle an Obama-era rule that increased the federal government’s role in protecting crucial waterways from being polluted. Trump has also proposed slashing the U.S. Environmental Protection Agency’s budget by nearly one-third, which would eliminate several water safeguard programs and further force already beleaguered local municipalities to try to fill the water infrastructure investment and management void. Even amid challenging conditions, Philadelphia has stepped up to the plate to address the issue of water affordability. Early this year, the city began accepting applications for its pioneering water bill assistance initiative, the Tiered Assistance Program (TAP). Born from legislation introduced by Councilwoman Maria Quiñones-Sánchez (D) and unanimously passed by the Philadelphia City Council in 2015, TAP offers a proactive assist to Philadelphians struggling to afford water. Instead of waiting until residents get behind on their water bill payments, as was previously the case, Philadelphians receive help with their water bills before they fall into arrears. Under TAP, a resident’s monthly water bill is not based on their consumption but rather set as a percentage of their household income and size. To help keep consumption levels in check, eligible households also receive information on water conservation along with free leak detection tests and low-flow plumbing fixtures. Households allowed to enroll in TAP are those with a monthly income of 150 percent of the federal poverty level (FPL) or below—approximately $3,075 or less for a family of four—or residents with a special hardship such as death of a primary household wage earner, a debilitating illness, or job loss. Under TAP’s income-based pricing structure, residents making up to 50 percent FPL would see a water bill that is roughly 2 percent of their monthly income. For example, under TAP, a family of four making around $12,300 per year would have a monthly water bill of about $20.50. The projected water charges would rise to 2.5 percent for those making between 51 percent and 100 percent of the FPL and would increase to 3 percent for households with incomes from 101 to 150 percent of the FPL. Once enrolled, TAP households’ outstanding water bill balances are placed in abeyance, and participants do not have to make payments on the outstanding balance while in the program. After two years of punctual payments, any penalties and interest that program participants have incurred previously are forgiven. The health and future of the nation’s fraught water infrastructure is under an unprecedented threat—a threat that has only been magnified by the actions of the current administration. Local communities’ efforts are making a meaningful difference, but they cannot make up for the absence of comprehensive, quality federal infrastructure investments or the need for a larger and more progressive public sector and private sector conversation around climate change, utility management, and equitable water pricing reforms. When it comes to the nation’s water system, federal, state, and local officials, agencies, and utilities must come together to confront not only the safety concerns surrounding toxic water but also the reality that it is rapidly becoming harder for many Americans to afford basic running water. Personifying its “City of Brotherly Love” moniker, Philadelphia provides a vital example of local leaders creatively and compassionately addressing the devastating repercussions of a widening water affordability chasm, even as they deal with an antagonistic White House. Innovative and just water utility pricing approaches such as Philadelphia’s, which encourage efficient water conservation but do not create an undue financial burden for already-strapped households, are a model solution. In the current era, it is ever more important for states and cities to follow Philadelphia’s lead by looking both inward and to one another for pioneering ways to better protect and support their most vulnerable residents. Water is life, and no American should ever be disconnected from it or risk losing their home simply because they cannot pay their utility bill. Rejane Frederick is an associate director for the Poverty to Prosperity Program at the Center for American Progress.